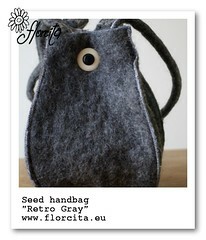 A new, sober and simple, comfortable and versatile seed handbag. It was hand felted with grey coarse wool and lines with a funky retro fabric. It closes with a vintage black and white button. It's listed in the Dawanda shop now.